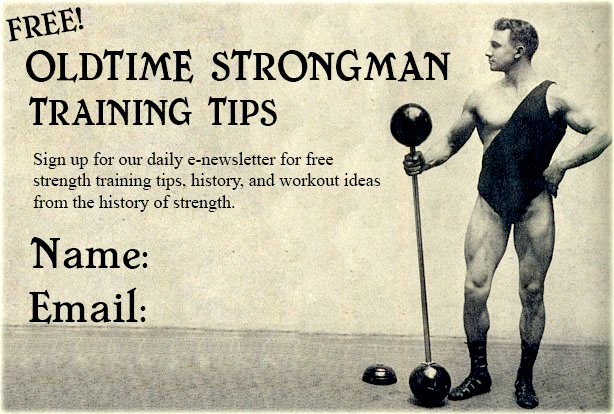 So, How DID the Oldtime Vaudeville, Circus and Stage Strongmen REALLY Train? … but anyone with an ounce of common sense knows that you can’t build the strength to lift heavy weights only by waving around 2-3 pound wooden dumbbells. The Henry Higgins Strength and Muscle Course, however, was written somewhere around 1915 and is one of the earliest — if not THE earliest — training course to promote the lifting of heavy weights for the purpose of building great strength. Thankfully, Higgins took plenty of notes during his talks with all these famous strongmen and built a fair share of his own strength throughout his many years in the gym business and he put it all together in his own extremely effective training course. In fact, using the training methods outlined in this course, the author is said to have once “put up” 254 lbs. with one hand. Higgins also trained a 20 year old Harvard medical student to do a one-hand dumbbell lift of 211 lbs. (at a bodyweight of only 145 lbs.) Another medical student who trained with Higgins succeeded with a 225 lb. lift. With nothing more than a set of gradual, adjustable dumbbells, the author guarantees that his training methods will enable the average trainee to clean and press a 140 lb. dumbbell in less than a year’s time! Out of all the famous strongmen that Higgins met over the years, which one had the most intelligent training ideas? The original edition of this course was uncovered among a huge collection of strength memorabilia which once belonging to the world famous Oldtime weightlifter, bodybuilder, and gym owner Sig Klein… which should tell you a lot right there. This course provides a fascinating look into the past and provides the actual training methods used by a turn of the century gym owner and genuine strongman. Putting the methods in this course into action will also show you that what made people stronger a hundred years ago still works every bit as well today… More importantly, the Higgins Course can and will teach you the incredible power of progressive training methods. The modern reprint edition of the Henry Higgins Strength and Muscle Course is 24 pages in length, 8-1/2 inches x 11 inches in size, is printed on heavy stock paper with a glossy cover. There are no pictures but the exercises are straightforward and simple to understand. The Henry Higgins Course belongs in the training library of every serious strength student!